Mehlspeise means meal made out of flour and it is a term you will hear a lot of times in Austrian Cafés – the waiter will not ask you if you want any cake or dessert, but ask you if you want a Mehlspeise. 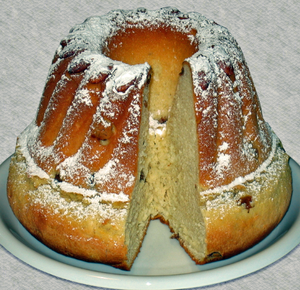 A Gugelhupf is a Bundt Cake and you will get it by the name “Napfkuchen” all over german speaking countries. Its roots go back to the romans, but there is also the story that the “Three holy kings”, after visiting Baby Jesus came to Alsace, where they were served a Gugelhupf. The French, call it “Kouglouf” and believe that it comes from Ribeauvillé. In the Biedermeier Period (between 1815 and 1848) the Gugelhupf became a symbol of the rich burgher, and was served with tea or coffee on sunday afternoons. (The Biedermeier was a time in which the Burgher did no longer press for political influence, but were satisfied with monetary gains). Since that time, this is a typical cake to serve for guests, especially family. The Sacher Torte is named after Franz Sacher in 1832 when count Metternich wanted something special for his guests. The Chef was sick, so the apprentice Franz Sacher took over the important task and created this chocolate cake with a layer of apricot jam and chocolate icing. He later on opened a deli, where he also sold this cake. His son Eduard made his apprenticeship at the Café Demel and improved on the existing recipe in this time. Later he founded the famous Hotel Sacher in Vienna. Due to this story there have been long legal battles between the Café Demel and the Hotel Sacher, who was allowed to use the name “original” Sacher Torte. After years of arguing the result was that the Hotel Sacher can use the name “Original Sacher-Torte” and the Café Demel the name “Eduard-Sacher Torte”, which is commonly called the “Echte Sacher Torte” (real Sacher Torte). Both variants are delicious and you will get them as “Sacher Torte” in every good Austrian Café. Leaving Austria without having tried one is an absolute “No-Go”, so do not miss out! According to Wikipedia this is a “national dish” of Austria and when I asked friends about typical Austrian meals, no one missed out on that one. There are some similiarities to Baklava, so many historians believe that it might have come to Vienna during the War against the Turks. 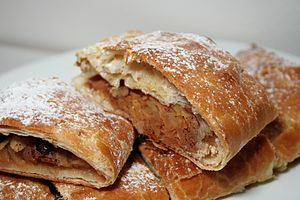 Apple Strudel is made of apples, raisins, bread crumbs and some cinammon and sugar – this is put into a pastry. It can be served hot, fresh out of the oven, or be eaten cold. You might get it with whipped cream, vanilla sauce or vanilla custard, but originally a Apple-Strudel does not need any of them. I can vouch for all this “Mehlteig” Classics and hope you can enjoy them on your next trip to Austria. If you already got any experience with any of this meals, I would be happy to hear about it! There is a hole in the Gugelhupf and its not as “fluffy” as a Panettone. Napfkuchen is the way they call it in northern germany, in Austria it is called Gugelhupf.